REVISTA UNCUT. THE ULTIMATE 2017 REVIEW. ENERO 2018. REINO UNIDO. EN INGLES. Bruce Springsteen en portada + 7 páginas interiores. BRUCE SPRINGSTEEN "I've never done an honest day's work!". EAN NUMBER - 9770028636994 ﻿ ﻿. Portada: NUEVA / Cover: Mint. Interior: NUEVO / Pages inside: Mint. Incluye CD / CD included. THE ULTIMATE 2017 REVIEW. ENERO 2018. Bruce Springsteen en portada + 7 páginas interiores. BRUCE SPRINGSTEEN "I've never done an honest day's work!". Portada: NUEVA / Cover: Mint. Interior: NUEVO / Pages inside: Mint. Incluye CD / CD included. Bruce Springsteen, our review of 2017, Father John Misty and Hurray For The Riff Raff all feature in the new issue of Uncut, dated January 2018 and out on November 16. 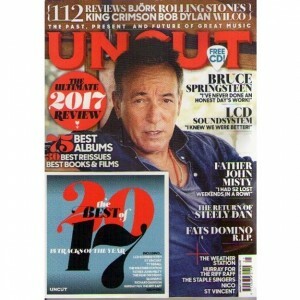 The Boss is on the cover, and inside Uncut follows Bruce from the Jersey Shore to the Walter Kerr Theatre for his solo shows on Broadway. What does it mean to be Springsteen in 2017? Is a new album imminent? Or is his latest show a final bow? In our review of 2017, we count down our 75 best albums of the year, the 30 best reissues of the year, the 20 best films and the 10 best books. Elsewhere, we join Father John Misty aka Josh Tillman in Laurel Canyon at the end of a momentous year, and find out how 2017’s most divisive artist has come to terms with fame and infamy, with decadence and abstinence, from LA benders to New York exile. Mavis Staples and crack musicians such as David Hood and Terry Manning reveal how they made The Staple Singers‘ classic “I’ll Take You There”, while Richard Dawson unveils eight records that have changed his life, from Iron Maiden to Sun Ra. In our news section, we talk to The B-52s’ Cindy Wilson about her new solo album, Joshua Abrams about his minimalist jazz trance, and celebrate Nico and the recently departed Fats Domino. Albums reviewed this month include Björk – with a substantial Q&A with the Icelandic pop maverick – Jim James, Noel Gallagher, Dan Michaelson and Robert Finley, while we also take a look at archival releases from the likes of Wilco, Bob Dylan, King Crimson, The Rolling Stones and Grandaddy. Films and DVDs covered include Monterey Pop, Bottle Rocket and Yorgos Lanthimos’ The Killing Of A Sacred Deer, while Uncut also catches live sets from St Vincent and Steely Dan, returning after the death of Walter Becker. This month’s free CD, The Best Of 2017, features some of the finest music of the year, from LCD Soundsystem, St Vincent, Ty Segall, The Weather Station, Father John Misty, The War On Drugs, Slowdive and Juana Molina.